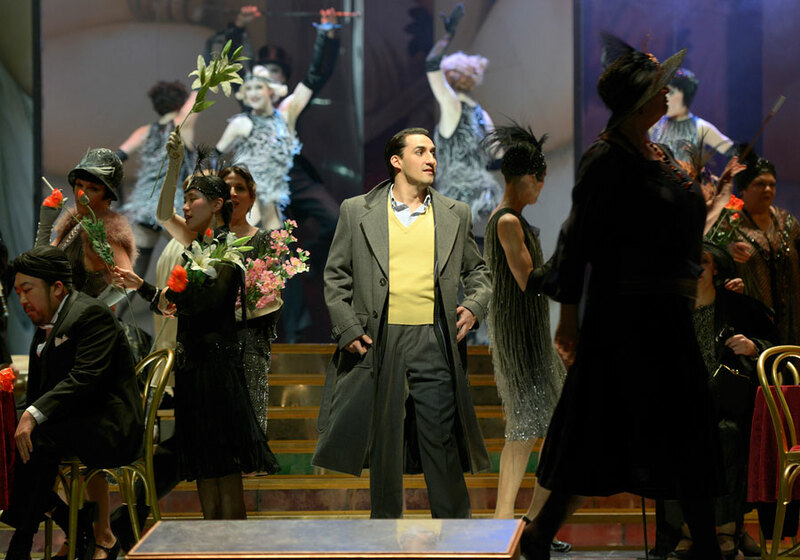 La Rondine was staged at the Deutsche Oper Berlin by star tenor Rolando Villazón. American tenor Charles Castronovo already played Ruggero for the premiere in March 2015, and he will take on this role once more. Mith Ermonela Jaho, Alexandra Hutton, Charles Castronovo, Matthew Newlin, Stephen Bronk et al. As of 12 February, Giacomo Puccini's opera LA RONDINE will return to the Deutsche Oper Berlin's repertoire. The piece tells the story of the courtesan Magda, known by all as "the swallow" – "la rondine" in Italian. She falls in love with the young and naive Ruggero, for whom she gives up her former life in sophisticated Paris to move out to the country. Yet she ultimately decides against both Ruggero and a return to her former love, and opts for a life of freedom: "The swallow continues its flight". LA RONDINE is one of Puccini's more uncommonly performed operas. The work, the creation of which was induced by a commission from the Carltheater in Vienna in 1913, was originally planned as an operetta. But while working on the piece that would premiere in Monte Carlo in 1917, Puccini elected for the through-composed form of an opera, although it is much lighter, more lyrical and less dramatic than TOSCA or TURANDOT, for example. How was it to work with director Rolando Villazón, himself a tenor? I've been friends with Rolando since 1997. We were in a Young Artists programme in San Francisco at the time, and were both just starting out. We worked on two operas then: The Magic Flute and La Traviata. I sang Tamino, he sang Alfredo. And I remember everyone thinking that we would become bitter rivals. As the two "first tenors" of that summer. But we shared the rehearsal room, tried things out and helped each other. When we met for La Rondine I was surprised at the great ideas he had as a director. Until then I had only known him as a singer. What makes his staging unique? Rolando moved the piece from the 1850s to the "Roaring Twenties", so that he can tell the story with a lot of glamour – especially in the second act, in the nightclub. Otherwise he brings a very honest and direct story to the stage, and adds some moments that give the staging its entirely unique character. For example, the three masked men who accompany Magda like shadows or memories, and whose function is only explained at the end of the piece. And there's a whole range of very subtle actions that give the staging its special charm. What was the significance of the role of Ruggero for you when you first sang it four years ago here in Berlin? I hadn't sung that many Puccini roles until then – the only other than Ruggero in La Rondine was Rudolfo in La Bohème. The other big tenor roles are somewhat too difficult for my voice. So I was excited to even be able to sing a Puccini role. There is this abundance of wonderful melodies that were very easy for me to learn. But Ruggero is also very interesting from a technical standpoint: the role is not particularly high for a tenor, aside from a few high notes. Then there's the rich and extremely vibrant orchestral setting, which also gets a deep and rich timbre from the singer. The work in this aspect was my main focus when I studied the role. What is the significance of Ruggero for your vocal development? Over the years my voice has become somewhat darker and likewise heavier. That happened, in my opinion, because I was patient and only expanded my repertoire very gradually. When I study a role that requires a heavier or sharper voice, I do that with great care and always wait to see how my voice continues to develop. Ruggero came at the right time within that developmental period. What makes La Rondine special? Nobody dies in the opera. That is rare with Puccini. Regarding Ruggero: he is honest. He is young. He is happy. He is in Paris for the first time. And he puts one hundred per cent into everything he does. Magda falls in love with him, but because of her past and her former life she is not able to completely commit to him. This baffles him to a certain extent. The challenge of shaping this role lies in singing the wonderful melodies with this overflowing "Puccini feeling" while simultaneously remaining honest and direct.